In the ancient Temple in Jerusalem, the kohenim, or priests, used to prepare the sacred space, light the candles and invoke the Divine Presence. With no priests and no Temple, today these duties fall to modern-day priestesses — kohanot. Each Friday night Jewish women all over the world prepare their homes for the Sabbath, light the Shabbat candles and say the blessing that invites the Shechinah, the Divine Feminine, into their homes. As they do, they symbolically act out the role of the Temple priests and become priestesses. Realize your dream of becoming a priestess. Take on Shabbat candle lighting as a spiritual practice. Preside as an kohenet, a priestess, over the sacred space you create and the ritual you perform. Invite the Divine Feminine Presence into your sanctuary and then dwell there with Her. This 34-page booklet provides the perfect guide for those wanting to draw out their Inner Priestess. In addition to its four clearly-described steps, the booklet offers three easily-used tools for awakening your Inner Priestess, officiating over both the beginning and end of the Sabbath and visualizing yourself annointed as a kohenet. Do you feel like a priestess at this moment? In all likelihood, you don’t feel like one, but you’d like to feel like one now or in the future. You’re probably also hoping you can discover how to become a priestess. Unfortunately, The Priestess Practice won’t teach you how to become a kohenet, the Hebrew word for priestess, because you already are a priestess. Deep inside, whether you know it or not, that is who you are. This booklet will teach you how to call upon the part of you that knows herself as a kohenet already – your Inner Priestess. She lies ready and waiting to put on her kohenet robes and to fill her role in your life and in the world. This book was written to help you remember your true self, to teach you how to find the priestess within, and to teach you how to bring her out, to let her become you, to experience her. In this way, you also can help others feel the sacred and the Divine in their lives and in rituals and prayers. This booklet also can help you get in touch with the kohenet tradition within Judaism and the priestesses that came before you, so you can call upon those traditions and the wisdom of those women to help you as you move into your role as a kohenet. That’s this book’s intended purpose – to assist you in opening to the part of you that is, was, will be, and always has been a priestess and to take on the role of kohenet. First, however, you have to understand the priestess part of yourself and that exists within the Jewish tradition. Then, you need to understand her role and how you can fulfill that role every week in your own way and in your own home by simply doing something Jewish women all over the world have done for hundreds of years – lighting Sabbath candles. Each time you do so, you create a mikdash, a sacred space, invoke the Shechinah, the Divine Feminine presence, into that sanctuary, and preside as a priestess over the ritual and blessings that usher inShabbat, the Hebrew word for Sabbath, and the Shechinah. Although this book draws on Jewish wisdom and traditions, anyone from any religious background or spiritual tradition may find its teachings relevant. After all, most Christian religions draw on the Old Testament, the Jewish Torah. Additionally, the matriarch’s written about in the Torah practiced pagan religions with priestess traditions before they practiced anything close to Judaism. Did Priestesses Exist in Jewish History? Why Don’t Jewish Women Feel Like Kohanot? Does Judaism Have a Goddess? Order your copy of The Priestess Practice and A Priestess' Workbook today! 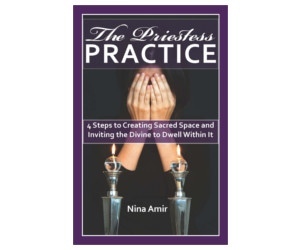 Don't forget to purchase The Priestess Practice Workbook! A Priestess' Workbook is now available as well to help any woman work through the process of becoming a kohenet and taking on Shabbat candle lighting as a spiritual practice. It's a perfect supplement to The Priestess Practice booklet.